I was born fifteen years after WWII ended. As a child I knew that my father had served as a Marine during the war and that he had been awarded the Bronze Star with the ‘V’ Device. The only other thing I knew about his time in the war was that when the John Wayne movie The Sands of Iwo Jima was shown on television we would watch it with my father. Towards the end of the movie there is footage of the rocket launchers firing, then a short view of four Marines carrying a wounded man on a stretcher. My father was one of those litter bearers, the man at the front and left. During the scene one hears an incoming mortar round. The men put the litter on the ground and dive into a foxhole. My dad would tell us that, “The pair of boots sticking up in the air is me after I pushed my Lieutenant in.” The scene only lasts a few seconds and ends abruptly. Years later I found out the reason it ended so suddenly was that the cameraman shooting the footage and the man on the stretcher were killed by the mortar. By 2003, I had been interviewing and recording many men and women who served in the war. I hadn’t been too interested in history even well into high school. It was just a lot of politically correct, stale names and dates. But once I started studying it in college and learned the personal stories of history I found it fascinating. One of my first assignments was to interview a veteran. I was fortunate to be able to speak with a WWI veteran and there began my passion. Over the ensuing years I continued interviewing veterans, as I found it incredible to hear first-hand accounts of those who were present during such iconic moments. Over time the stories became more personal, and the veterans would speak of the horror of war, becoming especially emotional when they spoke of their buddies dying. I felt truly honored that these men and women trusted me enough to share the most intimate and traumatic moments of their lives. I felt I had been given a rare opportunity and had a duty to honor these veterans by ensuring that their service and sacrifices would not be forgotten. The story I really wanted was my father’s, who was then eighty-seven. I nervously asked if he would let me interview him and he said yes. As we began the interview he asked me why I was doing this, and I replied that it was because I really wanted his story. He responded, “That’s not what I mean, I mean why now? I have four children and not one of you has ever asked me about this, so I assumed none of you cared.” My eyes teared up as I told him that of course we all cared and were extremely proud of him but that our mother had always told us to never, ever ask him about the war because he didn’t want to talk about it. Now my father’s grey eyes misted as he muttered, “All this time I thought you guys didn’t care.” After thinking for a moment he said “Your mother was a very smart woman. I didn’t want to talk about it, but now I can.” And so he began his story. In the fifty years since he had joined the Marines my father’s face and body had aged, he wasn’t quite as trim, and his once dark hair had thinned and greyed. Yet he was still the independent, responsible, outspoken, feisty man I had always known. I guess it’s true what they say: you can take the man out of the Marines, but you can never take the Marine out of the man. In 1943 Louis A. Hamilton of Chicago, Illinois, decided to join the Marine Corps at the ripe old age of 28. He was sent to boot camp in San Diego and then rocket school on Oahu, Hawaii, where he became a crewman in the 1st Provisional Rockets. From there he boarded a ship and was headed off to war, not exactly sure to which of the many Pacific islands he was destined. He had brought three books with him from home, one of which was a dictionary. While reading through the dictionary aboard ship he came across the Latin term Vis a Tergo, defined as “a propelling force that shoots forcefully from behind.” He decided that was the perfect definition of a rocket launcher and decided that would be the name of the rocket launcher he was to serve on. Vis a Tergo survived the war and is now part of the Mechanized Vehicle Museum at Camp Pendleton. I have read that the Marine infantrymen had a love/hate relationship with the Rocket Men. “On Iwo Jima we loved the ‘rocket men’ because we could not see where the Japanese were,” Anton Rebel, an infantryman with the 4th Marines, told me. “The infantry would stay back while the rocket launchers would go forward, and the second that first rocket went off the Japanese would fire at them with everything they had while we stayed back and watched where the fire was coming from. 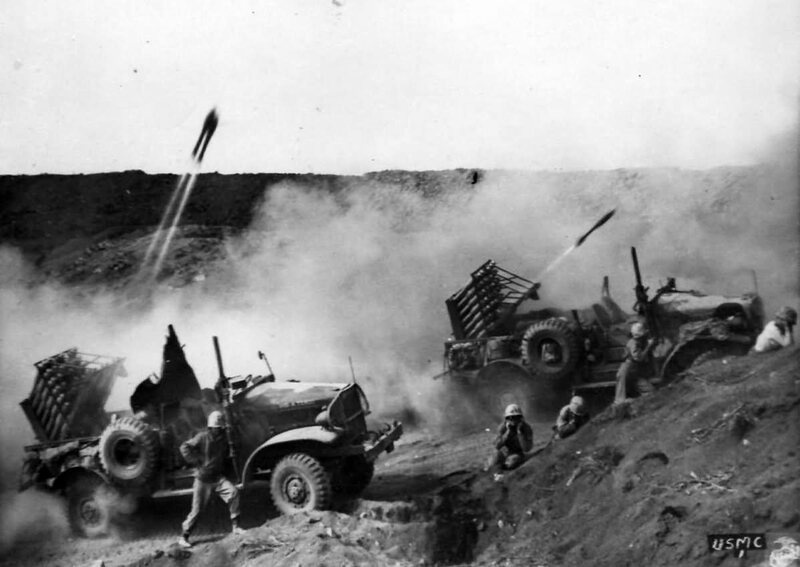 When rockets pulled back and we moved forward we at least had some idea where to concentrate our fire.” Unlike a lot of the jungle islands, Iwo Jima was flat and nearly treeless, making it the perfect setting for the rocket launchers to perform what they were designed to do. This worked both ways, though. They also hated the rockets for their tendency to draw Japanese fire since they were so conspicuous when fired. Shortly before arriving at their destination the Marines were informed that they were headed for Saipan in the Mariana islands. They watched for two days as naval guns and planes bombarded the island, thinking nothing could withstand the constant bombing. They were wrong. D-Day on Saipan was June 15, 1944. 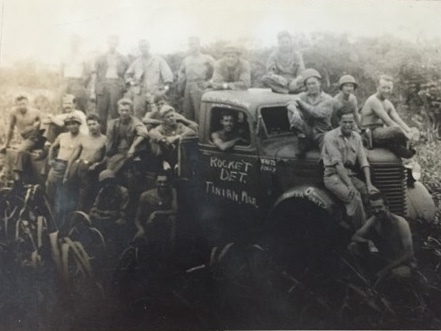 Early that morning they were fed their customary pre-landing breakfast of steak and eggs, “much to the disgust of the Naval surgeons.” My father didn’t talk a lot about the action he saw on Saipan. He did speak about the horror of watching Japanese men, women and children jumping from Malpin Point, sometimes mothers with infants in their arms. They threw themselves to their deaths rather than being taken prisoner by what they believed to be “the savage Americans.” He, as most of the Americans, was horrified by what they saw but could not comprehend. 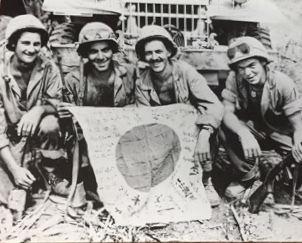 After Saipan his unit went to Tinian, another of the Mariana islands. Again, he refrained from commenting on the action, only mentioning his horror and disbelief of being aboard ship before the landing and again watching Japanese citizens committing mass suicide by throwing themselves off cliffs. When the Marines arrived at Iwo Jima they watched the naval and aerial bombardment go on for days. They believed nothing could survive that punishment. The veterans of previous campaigns knew better. The Japanese had been on Iwo Jima for approximately two years and had dug a massive network of underground tunnels connected to well concealed pillboxes. The Japanese fleet had been decimated in the Marianas and no ships would be coming to deliver the supplies, ammunition, food and water they desperately needed. Knowing their fate, their orders – their duty – was to kill ten Marines before they died. Iwo Jima has been described as hell on earth. The beaches are made up of black volcanic ash, which made it difficult to move men and equipment off the beachheads; it is also covered with sulfur pits, which gave off the smell of rotten eggs. Approximately a thousand civilians had inhabited the island, but the Japanese had evacuated them prior to occupying it in preparation for the inevitable Marine landings. They spent their time digging massive interconnecting underground tunnels where they lived and eventually fought. Iwo Jima is approximately an 8-square-mile island (just slightly larger than Key West, FL) dominated to the south by Mount Surabachi and on the other end by two airstrips. It is located approximately 750 miles from Japan. It was imperative to take this island to disable the radar atop Mount Surabachi and for use of the two airstrips. A crippled bomber returning from a bombing run over Japan often had nowhere close enough to land and very often crashed into the ocean. My father was aboard ship on D-Day February 19, 1945 and was one of the later landing parties to go ashore, for which he was always grateful. The initial waves faced tremendous difficulty moving men and equipment through the deep volcanic ash on the beach. The Japanese exacted a heavy toll from them, with 2,400 casualties on that first day. Yet the Marines prevailed. They improvised, adapted, and overcame, making it off those beaches and attacking the island’s defenders. It was a hard-fought battle against an enemy who refused to surrender. Mount Surabachi was taken on D-Day+4. My father said that he heard a noise that he soon realized was a cheer spreading like a wave. He turned to his right and saw the American flag flying atop Mount Surabachi. When I asked what went through his mind in that moment he replied, “I thanked God that those SOB’s would no longer be shooting down at me from up there!” When I asked how he earned his Bronze Star, he casually said that his rocket launcher jammed and he un-jammed it. I later got a copy of the citation presented with the medal. It stated in part that on March 6, 1945 the rocket launcher on which he was a crewman jammed while its crew was taking cover from heavy machine guns and sniper fire. Disregarding his personal safety, he left the covered position and climbed aboard the launcher. He stuck his hand into the jammed tube and dislodged the stuck rocket, thus enabling it to fire. He also spoke of a patrol during which he came upon a clearing where he found eight Japanese soldiers who had stripped off their uniforms and were sitting in a circle, each holding a grenade. To his horror he watched as each man pulled the pin on his grenade. The Battle of Iwo Jima lasted five weeks, costing the lives of 6,800 Americans and wounding over 19,000 more. Of the Japanese forces, numbering 22,000, approximately 21,000 died. I believe Admiral Chester Nimitz best summarized the Marines on Iwo Jima when he stated that this was where “Uncommon valor was the common virtue”. I had learned a great deal in these interviews. My father’s was different than most. He didn’t speak much about the horror he witnessed and survived, perhaps because he wanted to spare me from the brutal reality of war. As with any other interview, though, I felt honored to be trusted with this first-hand account. And I was struck once again that this war was fought by ordinary citizens who were asked by their country to perform extraordinary acts of bravery and did so. Secondly, I was reminded that true heroism is humble, that none of these men and women considered themselves or their actions heroic. For I have learned in speaking to those who fought this war they truly believe that they were simply doing their jobs and that the true heroes were the ones who gave their lives. Lastly, I have learned that time heals. With the atrocities of war it can take fifty years before veterans can talk openly about what they saw, endured, and especially of the friends they saw die. Throughout his life he remained close friends with many of the men with whom he had served. 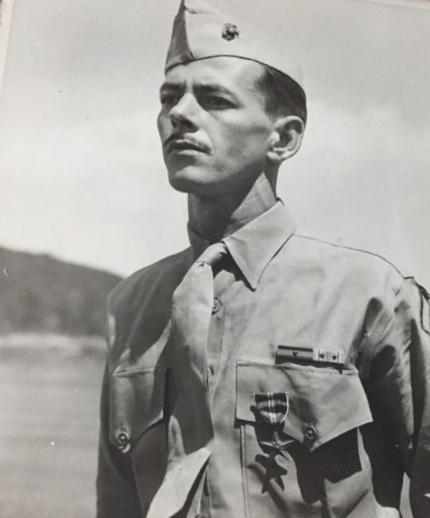 After he retired he began attending the yearly reunions of the 1st Provisional Rockets and on the 50th anniversary he traveled back to Saipan, Tinian, and Iwo Jima.